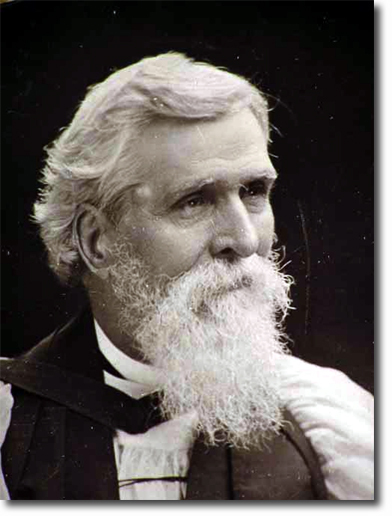 Rt Rev Dr Robert Caldwell, DD, LLD (1814-91) of Glasgow, Scotland. Born into a Presbyterian family at Clady, Belfast in Ulster. Trained as an artist in Dublin 1830-33. University of Glasgow (Robert Peel prize) & Glasgow Theological College 1834-37. Ordained as Non-Conformist Minister, Glasgow 1837. LMS Missionary to India. Madras 1838-41. Transferred to the Society for the Propagation of the Gospel (SPG) 1841. 800 mile journey on foot to Tirunelveli. Idaiyangudi 1841-83. Missionary Chaplain to the Bishop of Madras (GJT Spencer) 1844-48. LLD (Glasgow) 1857. DD (Durham) 1874. Senior Fellow of the University of Madras. Consecrated (SPG) bishop, coadjutor of the Bishop of Madras, 1877. Tuticorin 1883. Died at Kodaikanal in the Palani Hills aged 77.